Taking place after the events in Captain America: Civil War, Ant-Man and the Wasp sees Scott Lang (Paul Rudd) and Hope van Dyne (Evangeline Lilly) work with Hank Pym (Michael Douglas) to rescue his wife Janet van Dyne (Michelle Pfeiffer) from the Quantum Realm. However, their efforts are hindered by Ava ‘Ghost’ Starr (Hannah John-Kamen) and shady trader Sonny Burch (Walton Goggins). From the start, Ant-Man and the Wasp is at a disadvantage. Even though it is the 20th film of one of the biggest cinematic franchises in history, this is the first Marvel film highlighting a female leading protagonist – something DC Films achieved in its fourth cinematic instalment, Wonder Woman. After the recent announcement of a long-awaited Black Widow solo film and next year’s Captain Marvel, Marvel is now paving the path for female superheroes with their first female named superhero. 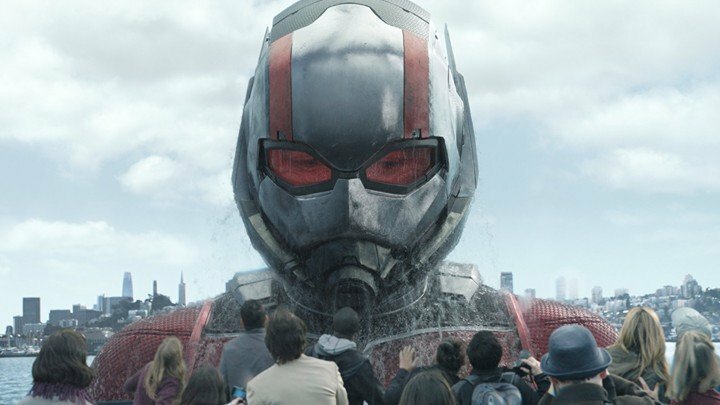 First things first – Ant-Man and the Wasp doesn’t answer any questions about Thanos’ actions, nor does it reassure audiences of the Avengers’ survival. Instead, it provides the escapism that Marvel films are not only here to win fans over – they are also here to entertain. The film has a lightheartedness that keeps it skipping along, dancing between Ava’s fast moves and Luis’ hilariously loose tongue (another great performance by Michael Peña) among several fast-paced action scenes. Coupled with the simplistic plot, this chaotic feeling prevents it from elevating past its crowd-pleasing approach. However, Ant-Man and the Wasp doesn’t waste any time in reinforcing the feminist angle. Lilly makes an impact as the second-generation Wasp, calling the shots and dominating the action scenes – showing that she is stepping up to the plate. John-Kamen also makes the most of her role as the wronged Ava. Originally a male character in the comics, she makes Ava her own with a determination that matches Lilly’s. With the exception of ever-charming Rudd, most of the cast is disappointingly underused, especially the highly anticipated Pfeiffer. In comparison to the rest of Phase Three’s instalments, Ant-Man and the Wasp doesn’t try and take things too seriously such as Captain America: Civil War, nor is it as modernistic as Black Panther. But it is entertaining and fun enough to keep your mind occupied until March 2019. Ant-Man and the Wasp is out in UK cinemas on 2 August.